I recently styled and hosted a My Little Pony Party for my daughter’s 6th birthday and it was so much fun! The decorations were all themed around Rainbow Dash and her rainbow mane, so lots of bright bunting, tissue paper pom-pom clouds, and table confetti were the order of the day. I was particularly pleased with the rainbow we created with the simple use of crepe streamers (although it did put my brother through slight trauma trying to get it all even to fit the gap). Rainbow table confetti and party ware, pom pom clouds and crepe rainbow. I decorated the party table with a plain white table cloth and sprinkled large tissue paper circle confetti down the middle. I used rainbow and My Little Pony napkins and found these awesome plastic bottles with straws. They were so good as there were no drinks spillages and I can use them again. I then finished the look with a few foil balloons. For the party tea I used cardboard lunchboxes from Party Delights and they were so effective! They saved a lot of time and there was a lot less wastage. Inside I put 2 finger sandwiches, a yoghurt tube, small packet of rasins, and I found some cute cardboard muffin pots to put a few cocktail sausages and sausage rolls. Dessert was a selection of small cakes, some great rainbow cupcakes and these brilliant rice crispie cakes lollies that I found on the Capture By Lucy blog. My daughter absolutely loved making them for her friends. Beautiful rainbow cup cakes, easy cake pops and a Rainbow Dash masterpiece! The birthday cake was made by a good friend and inside there were layers of rainbow sponge (sadly I didn’t get a photo of that). As you might already know, I like to make party favours a bit different (without spending fortune). Befitting of the rainbow theme we gave each party goer a small tin of rainbow paints and a strip of rainbow laces wrapped in a belly band of pretty paper and a thank you tag. I had a ball planning and designing this party and the birthday girl had such fun! I’ll be back soon with another blog about the party activities and the dress. Friendship is magic … (as the My Little Pony motto goes!). Want to learn more? see what Chelsea Mamma thought about our MLP craft party making manes, tails and decorating pencil cases. Sew, a needle pulling thread! 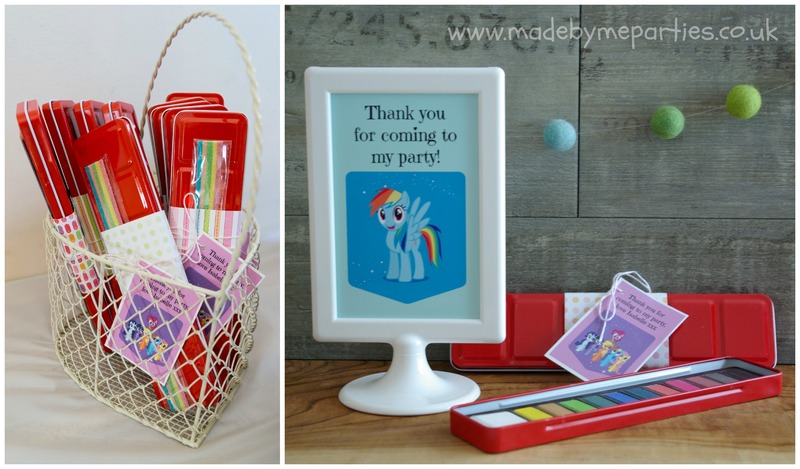 My Little Pony Party – All the fun and games! Hi! Can I ask you something? What inspires you to do party planning? I mean all the stuffs in your blogs are pretty cute and amazing. I’d love to do those when I age a little and have kids on my own. Hmmm. 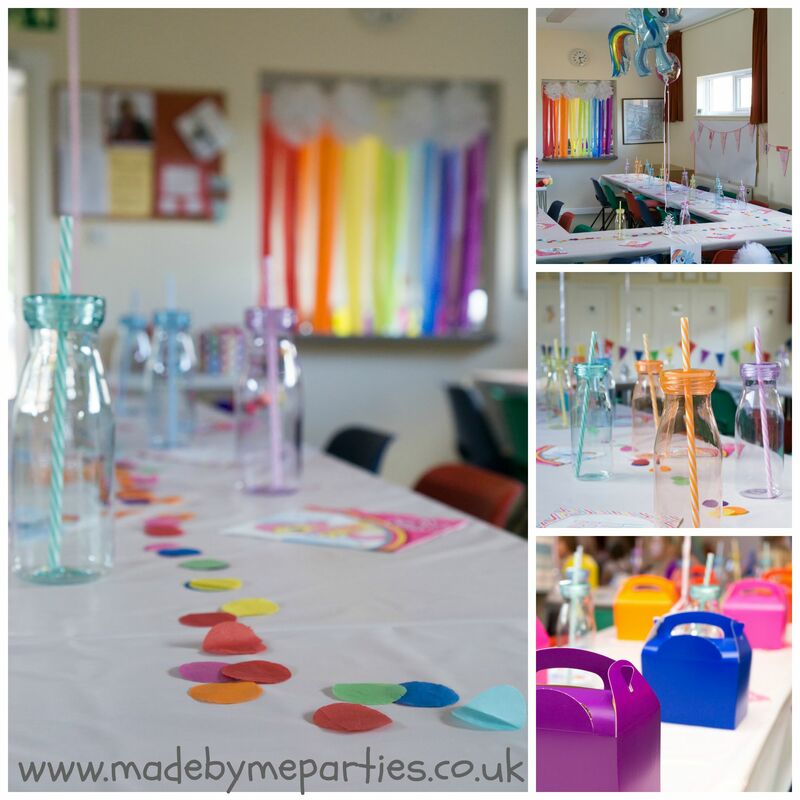 I just love creating things and making parties look lovely! I like to do something a bit different with the activities and party games, and by running a few unique parties for my own children, my business was born! Wow! That was so cool. You know what? I’ve thought of that just last year, will start to design and plan a party for my future family. That’s what exactly what I wanted to be. I just got an inspiration! I just hope they sell amazing crafts here at Philippines.